IN A surgical strike, Rakshas Mantri Manohar Parrikar in collusion with Judas Forward Fatorda MLA Vijai Sardesai stole the people’s mandate which was clearly in favour of secular forces and against the saffron Bharatiya Janata Party (BJP). In an unprecedented case of snatching victory from the jaws of defeat, Parrikar is all set to become Goa’s chief minister. On March 12, with a little help from Union cabinet colleague Nitin Gadkari, the Rakshas Mantri managed to buy, bully and manipulate a majority in the Legislative Assembly. COUP: In a dramatic coup, Defence Minister Manohar Parrikar and cabinet colleague Nitin Gadkari produced 21 MLAs before the governor to prove he had the numbers to stake claim to the CM chair. Shockingly, the three elected MLAs of the Maharashtrawadi Gomantak Party (MGP) headed by Sudin Dhavalikar and even the Goa Forward (GF) group of three MLAs headed by Sardesai and Porvorim MLA Rohan Khaunte extended support to the BJP which managed to secure only 13 of the 40 seats in the Assembly. It was no surprise that Dhavalikar chose to support the BJP as he has always gone with the party in power. 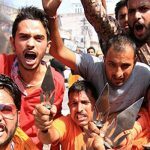 What came as a shock to GF supporters, including party president Prakash Timble was that Vijai Sardesai, who had functioned as a one-man opposition to the BJP for the last five years of saffron rule, agreed to join hands with the fascist intolerant Hindutva gang headed by prime minster Narendra Modi. 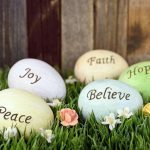 When the results came in on Saturday, March 11, the writing on the wall was clear. As widely expected, in the very first result, chief minister Laxmikant Parsekar lost to Congress candidate Dayanand Sopte by more than 7000 votes. The rout continued with another five BJP ministers biting the dust. Parrikar’s preferred successor when he moved to Delhi as defence minister, Rajendra Arlekar, lost to Babu Azgaonkar in Pernem. 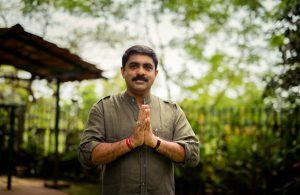 JUDAS REWARDED: Vijai Sardesai exorted his 30 pieces of silver on the form of cabinet berths for all three Goa Forward MLAs. the party was expected to support the Congress which won 17 seats, but switched loyalties to the BJP over the Congress Choice of the leader. Arrogant and allegedly very corrupt tourism minister Dilip Parulekar lost to Goa Forward’s Jayesh Salgoankar in Saligao. In Siolim, the GF candidate defeated veteran BJP MLA and alleged drug mafia don Dayanand Mandrekar. The other BJP minister who lost his seat was Mahadev Naik, industry minister and co-author of the notorious Investment Promotion Board. MGP president Deepak Dhavalikar lost to new comer Govind Gaude, an independent candidate in Priol. Unfortunately for the Congress and luckily for Parrikar, his nominee Siddharth Kunkolienkar managed to defeat Babush Monserrate in Panjim. But Kunkolienkar may not remain an MLA for long as he may have to give up his seat to enable Parrikar to become an MLA again. Under the Election Commission rules, nobody can occupy the chief minister’s post or the post of a cabinet minister unless he/she is an MLA or gets elected to the assembly within six months of being appointed to the position. Before he can be sworn in as chief minister, Parrikar will have to resign as union minister and as a member of the Rajya Sabha from Uttar Pradesh. AFTER a great deal of suspense due to the slow pace of counting in some constituencies in Mormugoa, Canacona and Velim with even rude sarcastic comments from NDTV anchors, it was clear that the mandate was against Parrikar and the BJP. The score card was clear. DOUBLE CROSS: GPCC Chief Luzinho Falerio is alleged to have double crossed Goa Forward by fielding Congress candidates in the constituencies of Fatorda , Siolim, Saligao, and Velim that were assured to Goa Forward. Contrary to exit poll predictions which believed the BJP would be the largest single party, the Sangh Parivar managed to get only 13 of 40 seats. The Congress perhaps was itself surprised that it won 17 seats on its own. The strike rate was 75 per cent in the case of GF which won three of the four seats it contested despite being double crossed by Goa Pradesh Congress Committee (GPCC) president Luizinho Faleiro. Porvorim MLA Rohan Khaunte who enjoyed Congress and GF support earned the distinction of being the only independent MLA to get re-elected to the Assembly. The MGP retained its status bagging three of 40 seats, the same strength as last time. Party president Deepak Dhavalikar lost as expected. Ponda MLA Lavo Mamladar also lost to former Congress chief minister Ravi Naik whose son was implicated in the Scarlet Keeling case. The MGP made up for its reverses by winning the Pernem Seat where Babu Azgoankar who jumped over from the Congress defeated Rajendra Arlekar, and Sanvordem through the victory of Deepak Pavaskar. Though Babush’s candidates won in Taleigao, St Andre and in Santa Cruz against Rudolf Fernandes, Babush himself lost to Siddharth Kunkolienkar in Panjim. 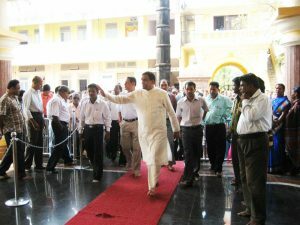 Churchil Alemao returned after 10 years from his traditional Benaulim constituency. This time too, voters rejected dynasties, with Joaquim Alemao being defeated in Velim. The only exception was Sattari where father and son, Pratap Singh Raoji Rane and Vishwajit Rane, won by comfortable margins. On Saturday, Congress spirits were high. It had managed to secure 17 seats on its own and an additional seat in Porvorim through its support to Rohan Khaunte. 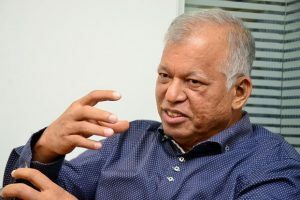 Since the Nationalist Congress Party (NCP) has a national-level alliance with the Congress and since Churchil Alemao cannot survive without a kodel, it was assumed that he too would support the Congress. With 20 assured seats, it appeared only a matter of time before the Congress successfully staked its claim to form the government. It was taken for granted that GF would support the Congress which would give the party a safe majority of 23 out of 40 seats. BUT there was unfortunately a catch. GF had made it clear to Congress high command observer Digvijay Singh that its support would depend on the chief ministerial candidate. OPPORTUNISTIC: MGP Leader Sudin Dhavlikar who wanted the hot seat was that first to offer support to the BJP on the condition that Manohar Parrikar would return as CM of Goa. Vijai Sardesai had told senior central Congress party leaders that GF was not willing to support the Congress if GPCC chief Luizinho Faleiro was nominated. Faleiro had double crossed GF after an understanding that the Congress would have an informal alliance and would leave the four seats of Fatorda, Saligao, Siolim and Velim to GF. I was witness to the double cross on the last day of nomination during lunch with Digvijay Singh and Dr Chella Kumar, the high command observers, at Mandovi Hotel. Five minutes before the end of time for filing nominations, there were frantic calls from Sardessai, and former Congress chief ministers Digambar Kamat and Vishwajit Rane claiming that Faleiro had issued letters to Congress candidates in all four constituencies in violation of the agreement. 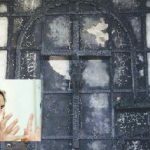 So Sardessai has a right to feel aggrieved. THOUGH the high command observers knew the position, they either did not have the authority or the guts to challenged Faleiro who insisted that by virtue of having delivered 17 seats when the Congress was expected to do even worse than last time when it got only nine, he was entitled to the kodel. Before the elections and after the results, he shockingly announced that he was willing to take MGP support to form the government. Unfortunately for him, the MGP rejected his overtures. Sonia Gandhi is away in New York for an annual check up allegedly because she has lung cancer. Rajiv, of course, is well known for his indecisiveness. While the high and low command dilly-dallied and dithered, Parrikar acted with lightning speed. 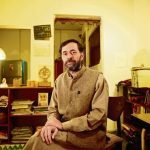 Even after it became clear that the Congress was the single largest party, he argued that the people’s mandate was in favour of the BJP as in terms of polling percentage, 35 per cent had voted for the BJP as against 28 per cent for the Congress. In our model of first past the post, it is not the party which gets the highest percentage of votes that necessarily gets the highest number of seats. But by convention, the governor is required to invite the party with the largest number of MLAs to form a government. By this logic, governor Mridula Sinha should have automatically invited the Congress. But what do you expect of governor who is a puppet of prime minister Narendra Modi and home minister Rajnath Singh? She is certainly to blame for murdering democracy in Goa and sabotaging the mandate of the people in favour of the Congress. But the Congress is equally to blame for not anticipating that Parrikar would go to any extent to retain control of Goa. After all, it got the entire Congress party to defect in Uttarakhand and toppled the Congress government in Manipur with the collusion of the governor. Presumably, Parrikar was depending on the fact that the governor will go by the instructions of the Sangh parivar – in this case senior ministers like former BJP president Nitin Gadkari and himself as defence minister. PROMISE BREACHED: Porvorim’s Congress-backed independent MLA Rohan Khaunte was re-elected with a comfortable margin but could not resist the BJP’s carrot of cabinet post. TO THE Rakshas Mantri’s credit, it must be admitted that he acted very fast and decisively, much faster than surgical strike against Pakistan. Parrikar had started talking about the BJP staking a claim to form the government even before the results were announced. He lost no time to get in touch with Sardessai as early as 9:30pm the day the results were announced. He was joined by Gadkari, the BJP observer for Goa, at 11:30pm. The BJP, or at least Parrikar, unlike the Congress, does not sleep when it comes to the question of capturing the government of Goa. 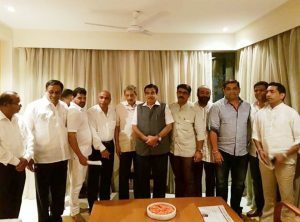 Gadkari, who is from Maharashtra and has a close equation with MGP’s Sudin Dhavalikar, met the latter at 1:30am at Cidade de Goa in Dona Paula. The MGP-BJP alliance was clinched with the number of the MLAs going up to 16 from 13 including the three MGP MLAs. But Dhavalikar imposed the condition that Parrikar should return as chief minister. On Sunday at 11:30am, the BJP asked the centre to relieve Parrikar to become Goa’s chief minister. To add icing to the cake, Churchil Alemao met Nitin Gadkari at 12:30pm on Sunday and pledged support to the BJP. But the Sangh parivar still did not have the required numbers. Even with MGP and Alemao’s support, they had only 17 MLAs, well short of the 21 needed to form government. So it was vital to get GF support. ACCORDING to Congress high command observers, Sardesai had said that he would decide on extending support after the Congress decided who would be the leader. He had also made it clear that he would not support the Congress if Faleiro was elected leader. It took the Congress nearly five hours to convince Rahul Gandhi that Digambar Kamat, the only chief minister acceptable to GF, should be elected as leader. But by that time it was too late. The birds had flown. Or rather, BJP eagles, rakshases Parrikar and Gadkari, had snatched the birds, the three-member GF group and independent MLA Rohan Khaunte. 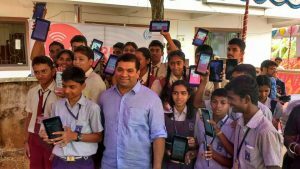 At 1pm, Calangute MLA Michael Lobo, who played a major role in helping the party get the numbers, went to Sardesai’s house and persuaded him to meet Gadkari in Panjim. Sardesai was asked whether he would be able to serve the people of Goa better in the opposition or as part of the ruling party. It was pointed out that there was no way the Congress could form the government as long as the BJP was in power in Delhi. To make things even more attractive, Sardesai has been bribed with the offer of deputy chief minister. Which MLA can resist the offer of a seat in the cabinet as well as the post of deputy chief minister and cabinet berths for other two party members? Power corrupts and absolute power corrupts absolutely. So it was not surprisingly that Sardesai could not resist the offer. The Congress clearly is a party in its sunset phase. It is clearly sinking. 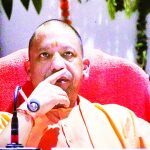 The BJP has managed to get more than 350 of the 420-odd seats in Uttar Pradesh, wiping out the Congress as well as the Samajwadi Party, and the Bahujan Samaj Party with Mayawati. With this, the BJP now rules almost the whole of North India, except Bihar and Punjab where the Congress defeated the Akali-Congress alliance. The BJP is also slowly taking over all the seven sisters of the North East, a Christian-dominated area. The only areas which have not been conquered by the Sangh Parivar are the southern states – Kerala, Karnataka, Tamil Nadu and Andhra Pradesh. FOR Parrikar, it was a matter of prestige. It did not matter to him that Parsekar was defeated by a huge margin in Mandrem, that six ministers had lost their seats, nor that the BJP had managed to secure only 13 seats on its own as against 21 seats in 2012. He was cheered that he had managed to retain Panjim with Kunkolienkar defeating the monster rat from Taleigao.Parrikar would not let the Congress form the government as it would be a personal insult and would lower his status in the BJP. After all, it was in Goa that Modi’s journey from chief minister of Gujarat to prime minister started with his blessing. There is a story about the cat which became old and weak and could not catch mice any longer. So it decided to wear a saffron robe and smear its forehead with kumkum and ash and pretend to be holy. It went to all the mice and told them it wanted to do penance. It was very sorry that it had been cruel and eaten so many mice in the past. The stupid mice trusted the cunning cat. They came close to it and the cat promptly pounced on them and ate them up. 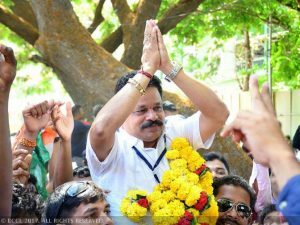 GIANT KILLER: Dayanand Sopte of the Congress defeated Chief Minister Laxmikant Parsekar by more than 7,000 votes. Similar is the case with Parrikar. There is no way he can claim a right to form a government on the performance of the BJP. But like the cunning cat, he knows how to trap greedy MLAs like Sardesai. He knows that everyone has a price. He has experience in horse trading. 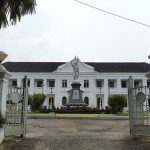 During his first tenure as chief minister, he got Babush Monserrate to extend support to the BJP by offering him the Town and Country Planning portfolio. New to politics, Babush was manipulated to the extent that he resigned his seat as a United Goans Development Party (UGDP) MLA to contest again and win on a BJP ticket. He also persuaded Pandurang Madkaikar and Isidore Fernandes of Canacona to resign as Congress members and get re-elected as BJP MLAs so he could hold on to power. Unfortunately, the guard he had selected to ensure that the sheep would not stray escaped and walked into the welcoming hands of Margaret Alva, then Congress high command observer. 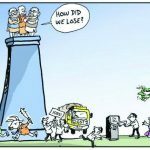 This is how Parrikar lost power in 2012. PARRIKAR has neither forgiven nor forgotten how Digambar Kamat betrayed him. More than keeping the Congress out, Parrikar is determined to keep Kamat out. 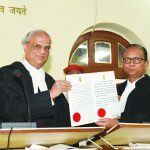 He may even have entered into a setting with Luizinho Faleiro to ensure that Kamat would not be chosen as the leader of the Congress Legislative Party by promising to spare popular wedding venue Kesarwal Gardens from the Supreme Court order banning the sale of liquor within 500 meters of national highways. Owned by Faleiro’s wife, Kesarwal is right on the highway and is their main source of income. As for Sardesai, I presumed he was not willing to wait any longer to enjoy the fruits of power like the red light on his car. Can the BJP be toppled from power? Can Parrikar be taught a lesson for hijacking the mandate of the people? Yes, the Congress can and we can. The Congress can appoint Digambar Kamat as the leader instead of the matka king Babu Kavlikar. Faith in the Congress is so low that nobody wants to be the leader of the 17-member party. 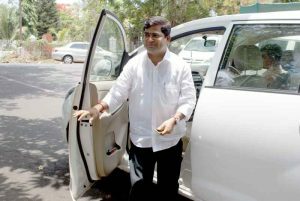 None of the five former Congress chief ministers – Pratap Singh Rane, Ravi Naik, Luizinho Faleiro, Churchil Alemao or Digambar Kamat – wants to be chief of the Congress Legislative party as they see it as a party sinking faster than the Titanic. But if Kamat becomes the leader, then Sardesai can be induced to withdraw support to the BJP. Khaunte and even the MGP can be asked to topple the BJP and install a Congress government. The voters of Fatorda, Saligao, Siolim and Porvorim can force the GF to withdraw support to the BJP. They voted for Goemkarpon, not for saffron Hindutva. Our destiny is in our hands. Never underestimate the power of a common man as Shah Rukh Khan keeps saying in Chennai Express. PS: Historically, the BJP has been a Hindu majority party. 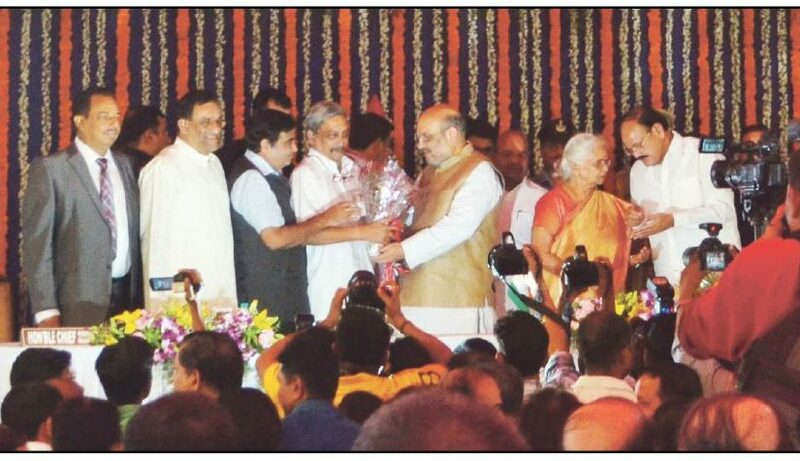 For the first time in 2012, Parrikar offered BJP tickets to minority Christian candidates and supported many others. All won, one of whom was made the deputy chief minister and the other fisheries minister. In 2017, the BJP has become the Catholic party. The Catholics are in majority – of the 13 BJP candidates who won, seven are Catholic.